I'm unaccountably sad about this. I always thought the future would, you know, be more advanced; instead we live in a world where people used to fly at more than the speed of sound, and used to travel to the moon. I saw a link in Bloggerheads to a New Statesman story about the way we treat children. I don't agree with all of this, but much of it hits home. Marianne will soon be 7. When I was her age, I walked home from school with my friends. Marianne and her chums are not released from the classroom until there's a responsible adult to take charge of them. The first school she attended required that all children were dropped off and collected, up to age 11. In the morning, we walked to school and were left at the school gate; now, nearly every parent waits with their child in the playground until the bell goes and they see their child go in with the teacher. Needless to say, little playing gets done. We used to go round to friends' houses in the street, and walk to the nearby playground, and to a local gully with a stream, to play for hours unattended. We encourage Marianne to walk letters to the postbox, which is up in the village; it's out of sight of the house but doesn't require her to cross a road. She's just about willing to do that, and actively enjoys running on ahead on our walk to school in the morning. Sometimes she takes the path through the churchyard, leaving her unattended for as much as 100 yards. She wouldn't go alone to even the nearest playground, let alone the nice one with grass that's a few streets away. Even if she did there wouldn't be much point, because the only children who play there without their parents are far older than she is. She attends an after school club; another of the attendees is the 12-year-old daughter of our neighbour. The walk to this club doesn't involve crossing a road, but nevertheless, our neighbour's girl isn't allowed to walk home alone; we'd be happy for Marianne to walk home in her company but it's not an option. When I was young, there were a gang of neighbourhood kids who played together. I suspect we caused mayhem. There are plenty of kids around here, but ones the age of my children don't play out together. However, parents like me are rigorous in spotting local events, like the Residents' Association barbecue, the family fun day, the Art Event, or Apple Day. At these gatherings, the parents chatter amiably, trying not to think about all the other things we'd rather be doing, while our children run around in a nice, safe, pack in a garden, playground, or playing field. We teach Marianne not ever to go anywhere without telling us or the adult responsible; but she hears that she shouldn't talk to strangers from everyone, all the time. The risk of her being abducted by a stranger over the course of her childhood is vanishingly small; the risk of her getting lost, or injured, and requiring the aid of a stranger is much greater. How paranoid are we? Last year we stayed in a hotel for a couple of days. One morning at breakfast, a fellow guest, a woman in her early 70s, suggested that it might be nice if she took Marianne and Jonathan down to feed the ducks in the duck pond. Of course, we agreed; but such is the atmosphere of our times that parents are now primed to instinctively mistrust even such obviously amiable people. Marianne has many friendships with adults whose relationship with her is somewhat more than, or different from, just 'a friend of my parents'. I believe it's important for children to develop friendships, with both children and adults, that don't always exist under the watchful eye of their parents. I saw a cartoon earlier in the year; I can't remember which artist. The punchline was 'We're raising them in captivity'. We fell out of anti-consumer mode with a big bump yesterday. First I had an intimate moment with the Apple Store; some of you may not be counting down hour by hour to the release of your next operating system upgrade, but for those of us with fewer Macs than people in the house, Fast User Switching is a killer app; we have a child-friendly, stripped down desktop (with a Hello Kitty background) for Marianne, and an even simpler one for Jonathan. And now they'll only be a click away. And then mid-afternoon we popped into Currys in search of very cheap video recorders. They didn't have any; there seems to be a price below which videos do not fall. But we noticed that the Playstation 2 can now be bought, bundled with an EyeToy, for £139.99. Woo, that's cheap. That's cheaper than I've previously seen a PS2 without an EyeToy. I've been faunching after a PS2 for a while; there are more dance games available for it, and the next Dancing Stage game, while it comes in both PSOne and PS2 versions, has more songs in the PS2 version, including Come on Eileen. And the EyeToy looks like fun. And I wanted to buy a board controller and play SSX. So we left with a big pile of boxes. It's now about a day later. Steven and I are both knackered from the effort of trying to control a snowboarding game with a board controller. I bought a Gamester Sportsboard in the end; it's relatively tiny (I mean, tiny for a huge physical controller). It acts as the directional and speed controls when playing; you plug a regular controller into it as well to manage your tricks. Unlike dance mats or racing wheels, there's no suggestion that you can control the game more easily with a board; it's incredibly difficult to start with, and after a dozen goes each, we're just about at the stage where we rarely randomly fall off the mountain any more (though falling off the mountain is a major tactic in SSX, don't get me wrong). Another couple of weeks and we'll be playing at about the level of Rank Beginner. Various unaccustomed muscles ache. Meanwhile, the EyeToy turned out to be better value than I was expecting. It links a USB camera that sits on top of your telly, with a set of little games that you control with your body. It's clearly a good cheap thrill to be able to see yourself on screen, and the controls (you wave at various bits of the screen to make things happen) are simple enough for Jonathan. The twelve mini-games are very simple; proof of concept rather than anything else. To win them you have to bounce around and wave your arms a lot. There's also a playroom for freeform bouncing around, allowing kids to see themselves onscreen in a variety of different environments. One of my children's favourite exhibits at the Science Museum is a room that displays multicoloured patterns as they dance; one of the dozen EyeToy playroom modes replicates this. 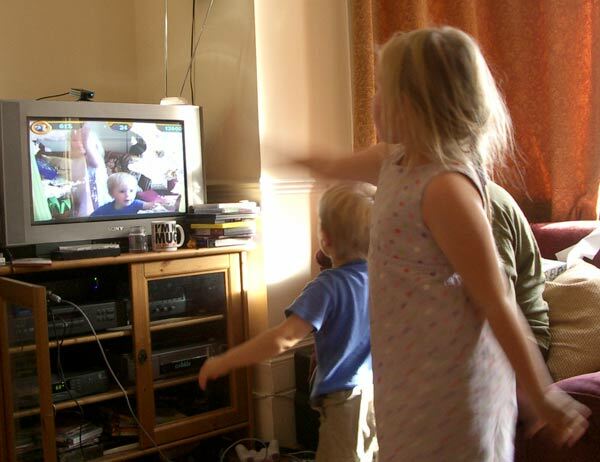 They played with EyeToy for much of the morning, and then challenged us to a series of family battles. The grownups won most of them, but it's not all that common to find physical games that adults and three year olds enjoy playing together. My theory? The next generation of EyeToy will be motorised, and user IDs will remember how tall people are; when you load it, it will automatically swivel up for Steven and down for Jonathan. With only a very few exceptions, the Americans I know are intelligent, literate, knowledgable, and sensible. Fine examples of the human race, in fact. Probably better, on average, than the Brits. So how come they're sharing their country with millions of people who are as thick as pigshit? Marianne is six. This week's maths homework goes as follows. "How many ways can you make 78p from smaller coins (1,2,5,10,20,50)? You can use them more than once." Any offers? I'd really like a good strategy for finding the solution too (my way was very slow), and a general approach for f(n) for arbitrary amounts of money (if you go for that, then there are also £1 and £2 coins in general circulation). I probably ought to add that Marianne's answer was 6, and she did write them out. I am pretty sure that was the sort of answer Mr Simpson was looking for; I would be very worried about the sort of six-year-old who can answer that question. Extra credit: Solve for US coins. Extra, extra credit: Solve for Wingdingian coins, which are arbitrary denominations of 1, a, b, c, d, and e Wingdingian centimes. As it's now October (September was another anti-consumer month, and we still managed to put £900 on the credit card), I gave in and bought a cheap scanner that will work with Mac OS X. However, the bundled OCR software is classic only (though there's a Windows version, which I've duly installed to run with my old scanner on the PC). Ideally, I'm looking for OS X native freeware OCR software. My demands on OCR software aren't great, to say the least; about 50 pages a year, mostly printouts from PCs. Failing that, I'm looking for cheap OS X native OCR software. Failing that, I'm wondering what the requirements are for the upgrade version of Omnipage Pro X (which is £85 for the downloadable version). Advice welcome. One day a couple of weeks ago, I followed a link in a comment in Teresa's blog, and found myself at Worth1000, a site largely devoted to Photoshopping, with daily contests. Reading the faq, I quickly discovered that every Photoshop I've ever done is on their cliché list of banned subjects. (I have previously done pictures with Star Wars, Star Trek, Lord of the Rings, Harry Potter, MC Escher, marijuana, WTC tourist guy, screenshots of malfunctioning computer systems, and, of course, Mr Bean. Not to mention two things that damn well ought to be on their cliché list, American Gothic and the Sgt. Pepper's cover.) Whoops. So, I've been over there, photoshopping away, and have learnt some new techniques and received one rather flukey second prize. You can see my attempts here. Legal ROMs, tuppence a pound! Over at Star ROMs they're selling Atari ROM sets for download. You play them with MAME or other emulator of your choice. Atari's the only copyright owner they've manged to bring on board at the moment, but they're negotiating with others. They have about 60 games, including Tempest, the game I bought a Griffin Powermate to play, and other longstanding Alison favourites like Tetris, Klax, Marble Madness and Gauntlet. Other games include 'classics of the genre' Missile Command, Asteroids, Centipede and so on. Most of the money goes back to the copyright owner, helping them to believe it's worth keeping their back catalogue available and encouraging the other companies to join in, and some of the profits will go to emulator development projects. You buy credits, allowing you to download games. If you buy more credits, they're cheaper, just like arcade tokens used to be in my youth (and probably still are). The games themselves work out at between $2 and $6 each before the discount. The $3.85 I paid for Tempest must work out at about a farthing for every time I've played it. (I do have a legal version of some of these games, bought from Atari, but I find MAME purer to play). He gives you 15 free credits to start you off; that's not quite enough to buy one of the better games, but it allows you to download a basic game to test your MAME setup. By paying for the ROMs, you get a nice, reliable, secure spot on the Internet to download them from. But better, you receive absolution, and a lovely warm feeling inside when MAME asks you if you're allowed to play Tempest.